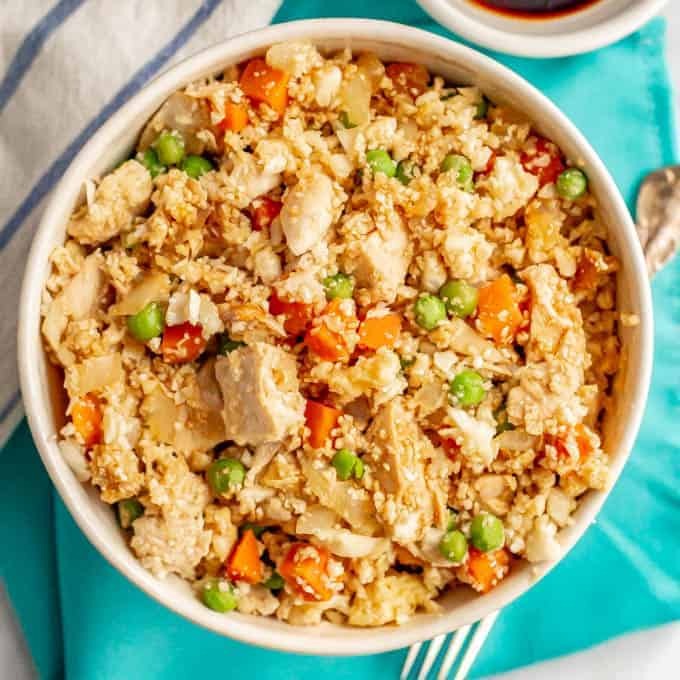 Quick and easy cauliflower fried rice with chicken is a delicious, colorful and flavorful low-carb dinner that comes together in just 20 minutes! But, after such a relaxing weekend, I’m totally OK with it. My husband and I started watching Marie Kondo and have been tidying up ALL the things! The kiddos had a spend-the-night with my parents over the weekend so we had a quiet night — and morning — to ourselves, which is always so lovely. I got tons of good sleep. 😴 So I’m ready to tackle this week! And while I don’t follow any of those eating styles, I love the stuff and love subbing it in for regular rice. It’s a great way to get in some more veggies! 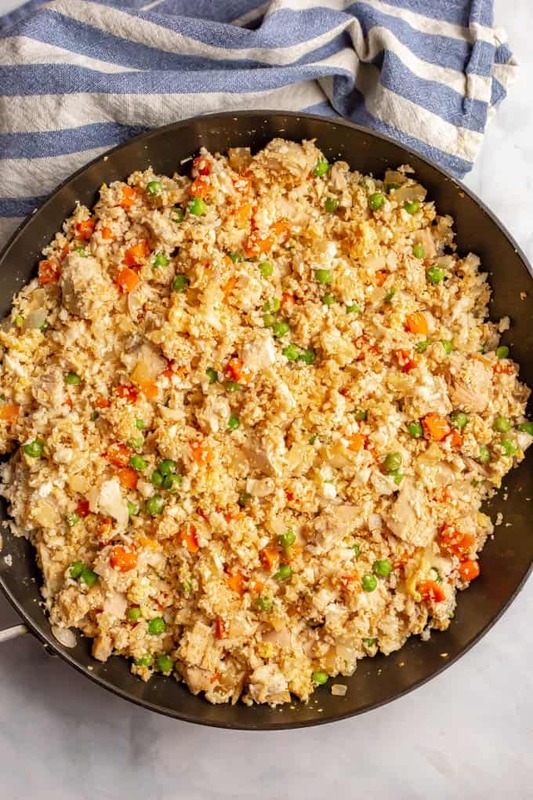 Today’s recipe for quick and easy cauliflower fried rice with chicken is one of my favorite ways to use cauliflower rice and to make it into the main dish. 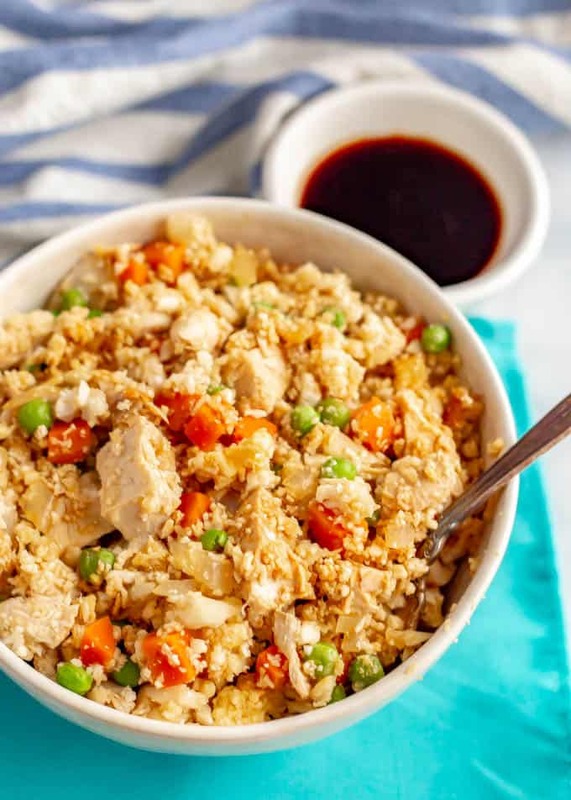 We’ve got the cauliflower, peas and carrots, eggs (optional, but I love them in my fried rice) and some chicken all mixed in together. It comes together in just 20 minutes and is so flavorful and satisfying! Or maybe you’re diving in with chopsticks if you’re cool like that. I am not. 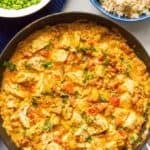 Regardless, this quick and easy dinner is perfect for a busy weeknight and it’s one everyone digs into. Plus, it’s so healthy, you can’t help but feel good about it! Sesame oil is used a lot in Asian cooking and you’ll frequently see it as more of a finishing oil than a cooking oil. I like how it perfumes this dish subtly with the flavors without being too strong. If you don’t have any, don’t worry, you can just sub olive oil or canola oil. Or even butter or coconut oil. Or you can substitute shrimp for the chicken. It would be great with this fried rice as well! 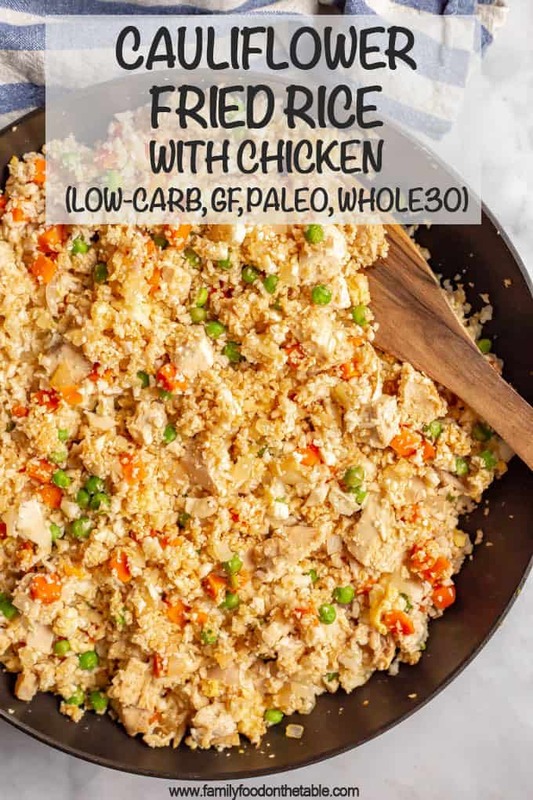 You can also make this gluten-free, paleo and whole-30 compliant if you use a soy sauce substitute such as tamari or coconut aminos, depending on your needs. If you want to add a spicy kick to this fried rice, I love adding 1-2 tablespoons of spicy Asian chili garlic sauce. You could also add a couple of teaspoons or sriracha to give it some heat. 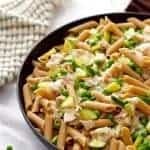 Extra veggies would be great to add in here as well! You could use some finely chopped broccoli, bell pepper, snow peas or even wilted greens like spinach or Swiss chard. Just make sure the vegetables are chopped small and get cooked until tender. Oh, and because I know some of you will want or need to substitute raw chicken breasts in place of the leftover/rotisserie chicken, I wanted to let you know how you can do that. First, cut the chicken breasts into small, bite-sized pieces. Then, heat the sesame oil in the skillet and add the chicken. Cook until it’s browned on all sides and nearly cooked through. Then just move it to the sides of the pan, add some additional sesame oil in the middle, and proceed with the recipe as written. Now, here are a few FAQs on cauliflower rice that I wanted to tackle. Yes. You can freeze raw riced cauliflower. Just make sure it’s dry and then divide it into portions in ziptop freezer bags. Make sure to label them and then pop them in the freezer for up to 6 months. 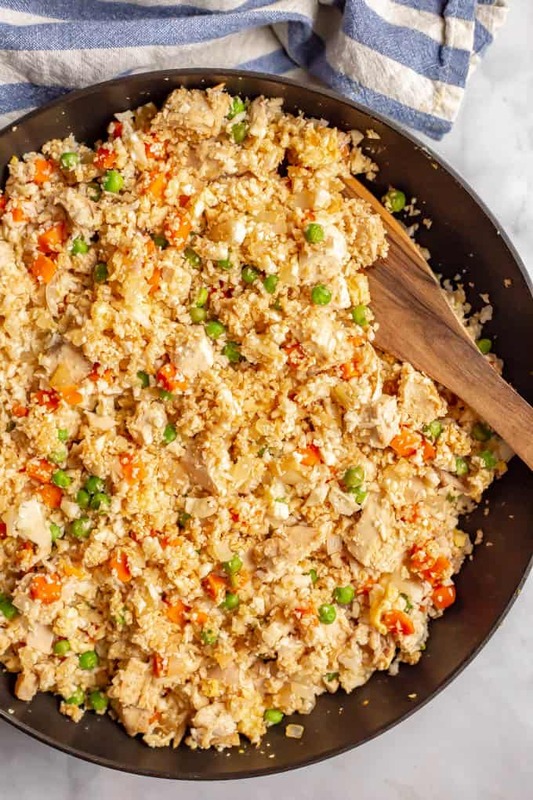 Can you make cauliflower rice ahead? Yes, you can definitely meal prep your cauliflower rice. It’ll keep uncooked in the fridge for 4-5 days. (I recommend storing it uncooked/raw.) Or you can freeze it, as described above. 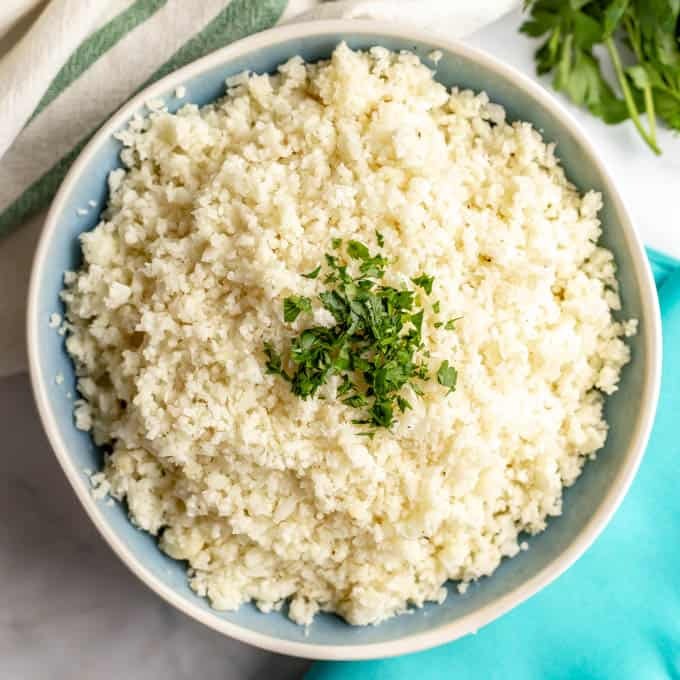 Can you make cauliflower rice without a food processor? Yes! 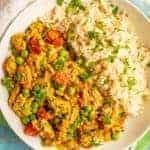 You can also use a blender to make cauliflower rice. Just go slowly and be careful not to turn it into mush. Or you can also use a cheese grater. I’ve done this before and while it takes a bit longer, it comes out exactly the same. 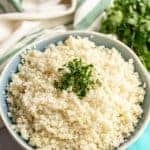 What are the nutrition stats for cauliflower rice? One cup of cauliflower rice has about 25 calories, compared with 218 calories for a cup of cooked brown rice. Cauliflower rice has 5 grams of carbs per 1-cup serving, compared with 45 grams for brown rice. Cauliflower also has lots of fiber as well as antioxidants, folate, vitamin K and even some protein. How much cauliflower rice does a head of cauliflower make? A medium sized head of cauliflower yields approximately 5-6 cups of rice, before cooking. Raw cauliflower rice doesn’t have much of a scent at all. However, cauliflower contains sulfur compounds that come out when it’s cooked. It has a slightly unpleasant smell but is less noticeable with cauliflower rice than other types of cooked cauliflower, I find. To minimize the smell, avoid overcooking the cauliflower. You can also add a squeeze of fresh lemon juice or vinegar. Is it cheaper to make cauliflower rice than to buy it? So you have to buy and pay about twice as much for the store-bought as you do for homemade. 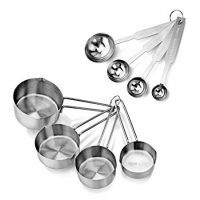 That doesn’t mean you should never buy the store-bought kind to have on hand, but I think once you see how easy it is to make yourself, you’ll be hooked! 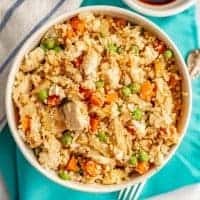 I hope you give this easy cauliflower fried rice with chicken a try. 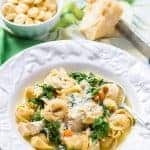 It’s such a quick weeknight dinner that the whole family will love! That’s a win in my book! Prepare cauliflower rice. Rinse and pay cauliflower dry and cut into large chunks. 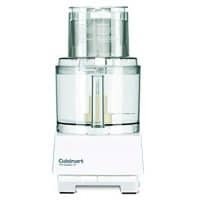 Add to a food processor, working in 2-3 batches. Pulse until the cauliflower is broken down and resembles rice pieces, about 10-15 pulses. (If you have a chunk that’s left, you can just remove it and add it to the next batch.) Transfer the cauliflower rice to a bowl and continue with the remaining batches. Heat sesame oil in a large skillet over medium heat. Add onion and sauté for 3-4 minutes, until softened. Add peas and carrots (it’s fine to add them frozen) and garlic. Stir until tender, an additional 2-3 minutes. Crack the eggs into the pan and stir until scrambled and mixed with the vegetables. 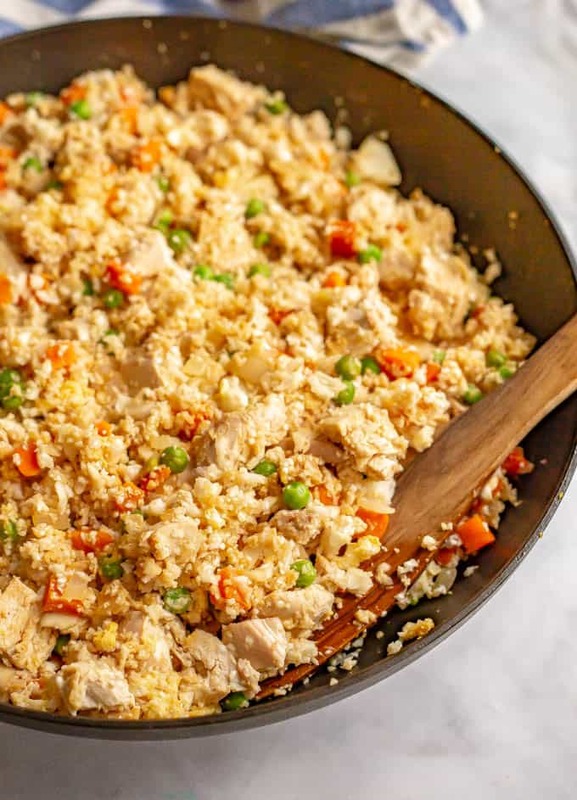 Add chicken, cauliflower rice and soy sauce to the pan. Stir until everything is well combined and heated through, about 2-3 more minutes. Serve with extra soy sauce if desired. I love how quick and easy the already cooked chicken makes this. 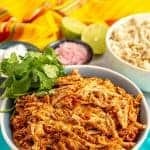 You can use leftover baked or grilled chicken or a rotisserie chicken. Or, if you want to use raw chicken breasts, cook them first. You can dice them up into bite sized pieces and cook them in the pan with some olive oil or sesame oil before you start the fried rice. 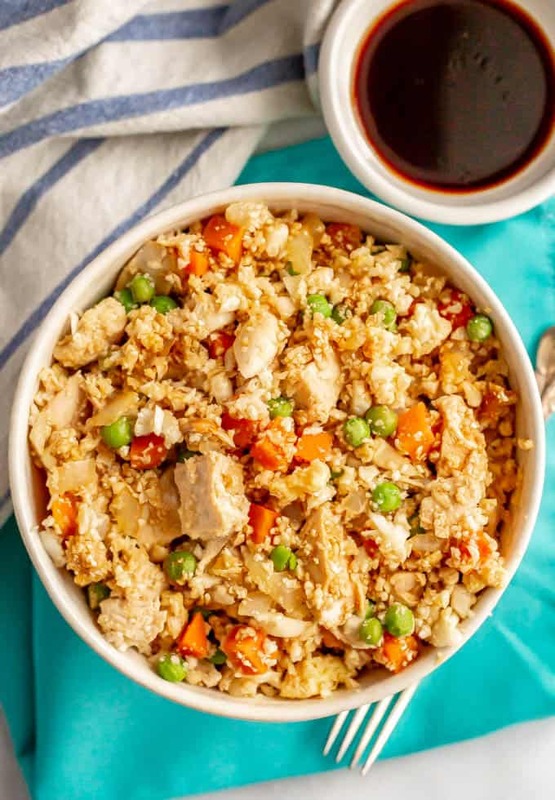 If you want to add a little kick to this fried rice, I love adding 1-2 tablespoons of spicy Asian chili garlic sauce. You could also add a couple of teaspoons or sriracha to give it some heat.